Borscht and juice aren't the only ways to consume your beets. Try one of these beet recipes to kick up your health—and your workouts. When it comes to getting more out of your body, it might be time to dig deep for Mother Nature's performance enhancer, the beet. This rosy red root vegetable provides a sweet taste that few of its fellow vegetable counterparts possess. The beet also possesses health-hiking and exercise-supporting benefits that can't be beat! What makes the beet so fitness-friendly? Much of it relates to the beet's nitrate content. Nitrates are substances your body converts into nitric oxide, which then works as a vasodilator to widen blood vessels. This in turn promotes blood flow, which has a favorable effect on both blood pressure and exercise capacity. To date, many studies demonstrating the efficacy of nitrate consumption have used concentrated beetroot juice, but this highly concentrated concoction usually has a sour, pucker-worthy taste. Fortunately, eating the sweet beet itself can enhance exercise performance, according to research. A Journal of the Academy of Nutrition and Dietetics study put physically fit people through two 3-mile treadmill time trials: 75 minutes after consuming 200 grams of baked beets, and 75 minutes following the intake of a cranberry-relish placebo.1 The beet trial resulted in increased overall running speed—particularly at the end of the trial—as well as a reduction in the perceived effort of the task at hand. The beet's health and workout benefits are undeniable. Without skipping a beat, here are three new ways to eat and enjoy beets throughout the day! Employing a roasting method to coax out more natural sweetness from the vegetables, this ruby red soup is sure to bowl you over. As with most purée soups, it actually gets better after being refrigerated for a day or two. This riff on hummus will trigger a sweet and savory tsunami in your mouth. 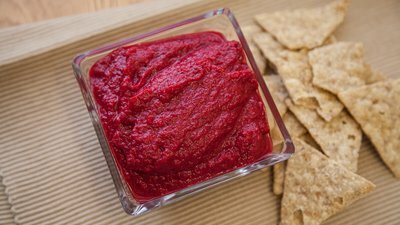 Use it as a dip for your favorite veggies, or slather it as a spread on your favorite whole-grain cracker, pita bread, or sandwich roll. You can also thin some of the beet hummus with olive oil and vinegar to use as a salad dressing. Here's a restaurant-worthy way to jazz up a plate of fish. And, unlike most cream-based sauces, this beety version isn't a calorie bomb. If desired, rainbow trout or arctic char can be used in lieu of salmon.